With more than two billion active monthly users, Facebook presents a huge opportunity for finding and connecting with customers across the world or right in your neighborhood. But, organic posts don’t always make it to audiences (even if they follow your page). So if you want to connect with audiences on this platform, you’re going to need to use Facebook ads. These tips will help you write Facebook ads that get in front of the right audience, catch attention, and drive users to click, buy, like, and convert. The first step in writing conversion-focused Facebook ads is to know your goals and define the intended conversion. Identify the action you want to happen when your audience sees your ad. To use Facebook for business, consider using one of the following goals. Once you know what you want your audience to do, it’s time to figure out who you want to take that action. You must outline exactly who you are targeting with your Facebook ad. Facebook has advanced hypertargeting features that allow you to create audiences using very specific criteria as it relates to user demographics, buying habits, interests, and location. Create a buyer persona for the exact person you want to see your Facebook ad, and then use Facebook targeting features to create an audience that matches the characteristics of your ideal customer. #3) Know your copy opportunities. 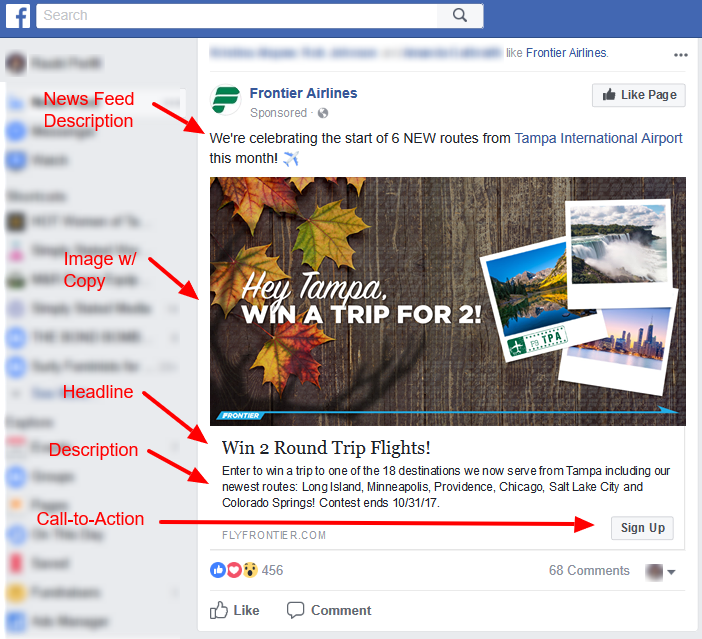 Writing Facebook advertising copy is different from writing any other type of ad because you have a unique set of copy placements. Before you start writing your ad, take a minute to consider the copy positions you have on your post. As you work on your copy and test out different ad variations, use AdParlor instead of creating your draft on Facebook. AdParlor is a social media tool that enables you to create and save ad copy in a mock setting so you can see what an ad will look like before you set up your campaigns. #5) Focus on one call-to-action. Facebook ads should be short and sweet, so you don’t over complicate your message. Identify the main thing you want your audience to do, and only use call-to-actions that drive users to take that next step. If you are directing audiences to do something in your headline and body copy, match the directive with your call-to-action button. In Facebook ads, it’s not just the copy that matters. Images are just as, if not more, important than the words you use in your ad. When deciding which image or images will work best, remember to always pair your ad with graphics that represent the story you are trying to tell. Connect the image back to the value you are presenting to audiences. When possible, you can also include a limited amount of text on the image to show the value. 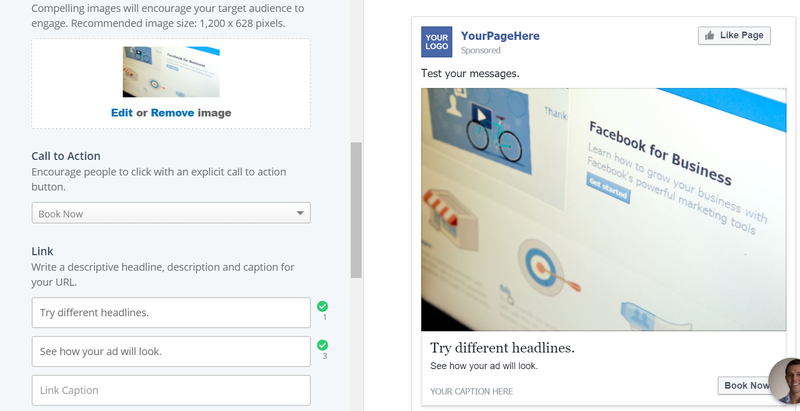 Facebook may reject ads that use too much copy on the ad, so use this tool to make sure you meet their guidelines before submitting your ad. As you write, keep one important thing in mind: You aren’t going to get your Facebook ads right the first time. The way to create high-converting ads is to test, test, test. #8) Tie it all together. Facebook ads give you a chance to connect with a very defined set of your target audience. Jump on this opportunity to grow your audience and meet new customers. But, remember: Facebook ads are just one piece of a larger lead funnel. To create a full-cycle marketing plan, your Facebook ads strategy needs to tie into all of your other digital marketing efforts and buyer stages. For tips on how to bring Facebook ads into your complete lead generation plans, grab our free ebook on Digital Marketing.